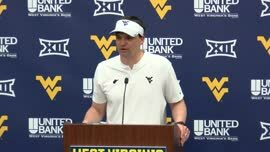 MORGANTOWN, W.Va. — Eight contributors to Mountaineer athletics make up the 27th class of honorees in the West Virginia University Sports Hall of Fame, announced Sunday by athletics director Shane Lyons. The 2017 class includes Chrissie Abbott (women’s soccer), Eddie Becker (men’s basketball), Willie Drewrey (football), John Havlik (men’s swimming & diving), Charles Hickman (baseball), Dan Mozes (football), Kevin Pittsnogle (men’s basketball) and John Spiker (administration/athletic training). Induction ceremonies will take place Saturday, Sept. 16, before the West Virginia-Delaware State football game. She became the first WVU women’s soccer player to earn first-team All-America honors from the NSCAA in 2002, when she scored 20 goals, dished out seven assists and led the program to its first NCAA tournament win. Abbott completed her record-setting career at West Virginia by leading the Mountaineers to the Sweet 16 in 2003 with a team-high 13 goals and eight assists. Abbott graduated as WVU’s career goals (53), points (125), shots (472), matches played (87) and matches started (87) leader. Abbott was the first Mountaineer to be named a M.A.C. Hermann Trophy (college soccer’s version of the Heisman Trophy) nominee in 2003 and finished as a semifinalist. The 2002 Big East Offensive Player of the Year, she served as captain the next season. Along with teammate and current associate head coach Lisa Stoia, Abbott was a 2003 member of the U-21 National Team Pool and a member of a select group of collegians invited to train with WUSA teams during the summer of 2003, working with the Philadelphia Charge and Carolina Courage. 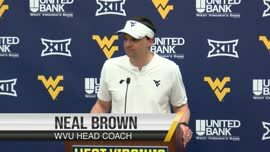 Abbott, a secondt–eam NSCAA All-American in 2003, was the co-winner of the 2004 Red Brown Cup, given to WVU’s most all-around outstanding student-athlete. A native of North Olmsted, Ohio, Abbott earned her bachelor’s degree in secondary mathematics from WVU in 2004 and a master’s degree in educational leadership in 2006. Abbott and her husband, Scott Bolan, have two children, Miles (3) and Jay (1). Since graduation, she has taught mathematics at New Albany (Ohio) High School. The Wheeling, W.Va., native ended his three-year basketball career at WVU in 1954 as the program’s second-leading scorer. Becker started 58 of 76 career games and finished with 1,127 points and 346 rebounds. Becker averaged 18.7 points as a senior and scored a career-high 33 points against St. John’s on Jan. 5, 1954. His teams went 23-4, 19-7 and 12-11 during his career. The 1952 team won the Southern Conference regular-season title and finished No. 9 in the AP poll. Becker was named to the SoCon All-Tournament team in 1952. As a senior in high school, he led Wheeling High to a 25-0 record and a state title, earned first team all-class all-state honors. He was inducted into the OVAC (Ohio Valley Athletic Conference) Hall of Fame in 2016. Becker currently lives in Wellington, Fla.
An exciting receiver and kick returner who played on four bowl teams for coach Don Nehlen from 1981-84, Drewrey piled up 3,508 all-purpose yards, which ranked third at the time and now ranks 10th in school history. A four-year letterwinner whose teams posted a 35-13 record during his career, Drewrey participated in the 1981 Peach Bowl, 1982 Gator Bowl, 1983 Hall of Fame Bowl and the 1984 Bluebonnet Bowl. Drewrey compiled a then-school record 1,542 all-purpose yards in 1984. He averaged 27.3 yards per kickoff return in 1984, ranking third in the nation. Born in Columbus, Miss., and raised in New Jersey, Drewrey still holds the school record with 1,109 career punt return yards on 108 attempts. Drewrey is the only player in school history with 1,000 punt return yards and only one of 14 in NCAA history to do so. Drewrey left WVU as the school record-holder in career kickoff return yards with 1,329 on 54 attempts and now ranks fourth. His 24.4 career kickoff return average ranks fourth in school history. He had 10 touchdowns — five receiving, four kickoff and one punt return — in his college career. In the 1984 Bluebonnet Bowl he had career-bests of six catches for 152 yards in the 31-14 win over TCU. A Sporting News All-American in 1984, Drewrey became an 11th-round pick of the Houston Oilers and played in the NFL for nine seasons with the Oilers (1985-88, 93) and the Tampa Bay Buccaneers (1989-92). Havlik became WVU’s first U.S. Olympic swimming trials qualifier in 1980 and three-time NCAA swimming qualifier from 1978-80. A native of Glen Burnie, Md., Havlik helped the Mountaineers to a 31-6 record during his career. In 1980, Havlik was tri-captain and led the Mountaineers to a 9-0 mark, the school’s first-ever undefeated, untied season. A four-year letterwinner and three-time team MVP, Havlik was an eight-time school record-holder in these events: 200-, 500- and 1,000-yard freestyle events, 400-yard individual medley, 100- and 200-yard butterfly events and member of the 400-yard medley relay and 800-yard freestyle relay. Havlik was selected as the Most Outstanding Swimmer for the 1979 and 1980 Eastern Intercollegiate Swimming & Diving Championships – the first swimmer in WVU history, male or female, ever selected for that award. He was a six-time Eastern Intercollegiate swimming champion. Havlik earned a spot on the 1979 All-East swimming team in the 200-yard butterfly and was named to the All-ECAC All-Star Team in the 200-yard butterfly (1977, 1978 and 1979) and 500-yard freestyle (1979). Havlik was chosen to attend the 1979 Olympic Development Swimming Camp, and was a four-time qualifier to the AAU Indoor and Outdoor National Swimming Championships. Havlik won the 1979-80 WVU Athletic Council award, honoring the senior WVU athlete for athletic performance, sportsmanship, dedication and academic achievement. Havlik finished his degree at West Virginia while helping Hall of Fame coach Kevin Gilson as his assistant coach in 1980-81. He enlisted in the U.S. Navy in 1982 and was assigned as an assistant swimming coach and physical education instructor at the Naval Academy from 1982-84. In 2014, Havlik retired from the Navy with a rank of Captain after 31 years of distinguished service. For 29 of those years, he was an officer in the SEALs – the Navy’s elite special operations forces. Havlik has continued to garner many swimming accomplishments at the United States Master’s Swimming level, including national championships, All-America honors and numerous U.S./world top-10 rankings. Hickman played baseball in 1896, then coached the Mountaineers for four seasons after his 15-year pro career. Following his playing days as a pitcher at West Virginia, Hickman played for a professional baseball team in the Interstate League in New Castle, Pa, in 1896. His major league baseball career began in 1897 with the Boston Beaneaters (1897-1899). He then played for the New York Giants (1900-01), Boston Americans (1902), Cleveland Bluebirds (1902-04), Detroit Tigers (1904-05), Washington Senators (1905-07), Chicago White Sox (1907) and Cleveland Naps in 1908. He played with Toledo in the American Association in 1909-11. Known for his power, he hit .369 in 1902 (third in the American League) and batted .330 in 1909. Six times during his career, he ranked among baseball’s top 10 in slugging percentage and home runs, hitting 12 in 1903 (second in the American League). Hickman led the American League in hits in 1902 with 193 and total bases with 288. For his 12-year career, he hit .295 with 59 home runs and 614 RBI, playing every position but catcher. Hickman remains the most prominent player with WVU ties to have played in the major leagues. Hickman had many nicknames while in baseball – Piano Legs, Cheerful Charley, Happy Hick and Handsome Charley. Hickman then became a scout for Cleveland, holding the job for 14 years. From 1913 and 1915-17, he coached the WVU baseball team and posted a record of 56-25-1. A native of Taylortown, Pa., Hickman entered politics in 1918 when he was elected recorder of Morgantown. He became mayor the same year and served three terms, retiring in 1921. Hickman re-entered politics in 1928 when he was nominated and elected as a justice of the peace in the Morgan District. He served in that position for 18 months. On Jan. 1, 1933, Hickman was elected as sheriff when the county was in The Great Depression. Hickman died while in office as sheriff on April 19, 1934, at the age of 57, leaving behind a wife, Pearl, and children, Harriet and Charles Jr. His wife, Pearl, served out his term and was the first female sheriff in Monongalia County. His grandson, Jim Hess, was a letterman on the WVU golf team in the early 1960s. A four-year starter from 2003-06, Mozes was among the best offensive linemen ever at WVU during one of the greatest periods in program history. 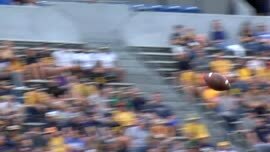 A native of Washington, Pa., Mozes was one of the main cogs of a line that led the Mountaineers to a 38-12 overall record, three Big East championships, four bowl appearances, including the first BCS bowl appearance and win in the school’s history — a 38-35 win over Georgia in the Sugar Bowl. As a senior in 2006, Mozes won the Rimington Trophy, signifying the nation’s best center, and became the first player in school history to win a national player of the year honor. He earned consensus All-America honors, one of 11 Mountaineers in school history to do so. He was one of 12 Lombardi Award semifinalists and an Outland Trophy finalist. 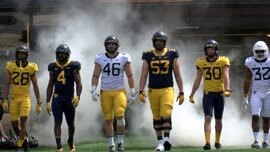 In 2006, the WVU offense averaged 38.8 points per game, 303 yards-per-game rushing and 461.4 yards of total offense. In 2005, Mozes helped lead the Mountaineers to an 11-1 record and 7-0 mark in the Big East. WVU participated and won its first BCS game in school history, defeating Georgia in the Sugar Bowl in Atlanta. Mozes started the first three games at guard that season before moving to center. He earned Associated Press All-America Second Team honors, All-Big East First Team honors and was a Rimington Trophy finalist. Mozes was a CoSIDA Second Team Academic All-American, a three-time All-Big East First Team selection, a three-time All-ECAC selection, Big East All-Freshman selection, a second team freshman All-American from The Sporting News and a Sporting News Big East All-Freshman selection. Mozes played in the Senior Bowl and signed as a free agent with the Minnesota Vikings in 2007. He sustained a season-ending knee injury in August and retired from the game in 2008. Following his football career, he served as an assistant strength coach at Michigan. He now serves as vice president, national director of training, for Barwis Methods, in Plymouth, Mich.. In 2006 Pittsnogle became WVU’s first basketball All-American since 1972. A 6-foot-11 center from Martinsburg, W.Va, he averaged 19.3 points and 5.5 rebounds per game in 2006 to help the Mountaineers to a 22-11 record and the school’s second straight Sweet 16 appearance. Pittsnogle became WVU’s first basketball All-American since Wil Robinson in 1972 when he was named to the 10-member John Wooden All-America Team and was a third-team selection by the NABC. In 2005, Pittsnogle helped the Mountaineers to a 24-11 record, a Big East Tournament runner-up finish and an appearance in the NCAA Elite Eight. At the time, it was WVU’s best finish in the NCAA Tournament since a runner-up finish in 1959. As a senior in 2006, Pittsnogle shot 47.6 percent from the floor and finished his career with 1,708 points to rank sixth at the time among all scorers. He shot 41.1 percent from 3-point range for his career, ranking second all-time in school history. At the time, Pittsnogle was WVU’s all-timer leader in 3-point field goals made with 253 and now ranks second. Pittsnogle was selected to the All-Big East First Team in 2006. He scored a career-high 34 points against Canisius and tallied 20 or more points 18 times in 2006. He averaged 17.0 points in three NCAA tournament games as senior. Pittsnogle made 91 3-point field goals as a senior, then the second most in a season in school history. He started 105 career games, which ranked as the ninth most at the time. At the end of his career, he was sixth in career free throw percentage (81.6 percent), was ninth all-time with 28 20-point games and ranked first in career games played with 128. Pittsnogle graduated with a bachelor’s degree in athletic coaching education. He signed a free-agent contract with the Boston Celtics in 2006. Pittsnogle earned a master of arts degree in education and human services of multicatergorical special education from WVU in May 2017. Pittsnogle is a special education teacher at Martinsburg High in the Berkeley County School District. He has six children: Michael, Kwynsie, Treye, Amyyah, Kamdyn and Nehemiah. Spiker cared for West Virginia University student-athletes from 1975-2015. His duties over those 40 years involved overseeing the athletic training services for all sports and supervising the rehabilitation for injured student-athletes. Spiker began his athletic training career as a student with the WVU men’s basketball team under WVU Sports Hall of Famer Whitey Gwynne. Gwynne put him to work immediately and was instrumental in helping him get his first athletic training job at Pitt. During his three years at Pitt, he worked with the football and wrestling teams, and completed requirements for his master’s degree. Following his time at Pitt, he enrolled in the physical therapy program at Penn. 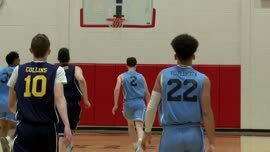 Upon completion of his physical therapy degree, he joined the athletic training staff at North Carolina, where he worked football, lacrosse and men’s basketball with legendary coach Dean Smith. In 1975, Spiker was recruited by Dr. Bill Douglas to return to his alma mater to serve as head athletic trainer and to develop a formal curriculum for the athletic training program. Spiker served as director of that program for 10 years. In 1991, he was named coordinator of athletic medical services, a position he held until his retirement in 2015. The WVU Athletic Training Program is recognized as one of the best in the country. After graduation, many former students successfully pursue athletic training positions in high schools, colleges, professional sports and international competitions. Many other graduates become professional educators, physical therapists, physicians and physicians assistants. Three WVU graduates of the Athletic Training Program have been elected to the NATA Hall of Fame. Nationally recognized in sports medicine and athletic training, his peers voted him the 1980 Collegiate Athletic Trainer of the Year. The NATA named him Distinguished Athletic Trainer in 1994 and inducted him into the Hall of Fame in 2012. In 1993, he was inducted into the WVU College of Physical Activity and Sport Sciences Hall of Fame, named the WVU School of Physical Activity and Sport Sciences outstanding alumnus in 2007 and named to the Mid-Atlantic Athletic Trainers Association Hall of Fame in 2011. Spiker continues to use his credentials in athletic training and physical therapy to direct HealthWorks Rehab and Fitness, with locations in West Virginia and Pennsylvania. A native of Bruceton Mills, West Virginia, Spiker and his wife, Sabra, have three children – Heather Throckmorton (John), Tim (Sarah) and Zach (Jenn) – and seven grandchildren.